In 2018, a student shows school spirit. Magnetic Experience January 23, 2019 to students and parents who wanted to gain an overview of the academic, athletic and activity programs at South. ​ After a welcoming program in the Paladin Playhouse, the guests toured the school and meet many of the faculty, students and parents. The gym was filled with displays from elective courses, sports teams and school clubs. ​ In August, new students to South Plantation first learned about their high ​school and the environmental magnet program by attending Camp Everglades. scavenger hunt before practicing team building in a low ropes program. At the end of camp the newcomers set their goals for academics and activities before going home. he projects as the students explain the work they completed, similar to science projects. station located outside the magnet building others to charge their cell phones, others made clothing out of recycled items, organized community-based environmental activities, and several created the annual report and environmental based opinions in the news. Once again, Tree Tops Park in Davie opened its gates for the annual Water Matters Day festivities. Personnel from many groups and companies shared their environmental knowledge March 11, 2017. 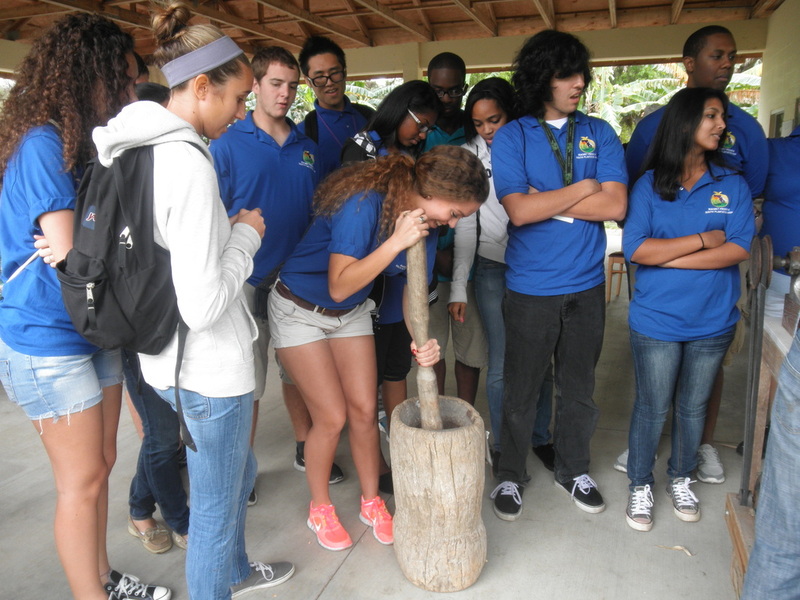 Magnet students from South Plantation High have participated for all 15 years of the event. More than 70 booths were filled by exhibitors making it an educational and fun-filled day. Missing from this year's event, was the Water Bus, the mobile classroom manned by the ER Ambassadors from SPHS. In its place were three booths filled by 4-H members and the ER Ambassadors. Children held animals and made crafts at the booths. Adults had their landscape questions answered and even purchased blooming plants. For the past 10 years, the costume of Freddy, the South Florida Water Management mascot, has been worn by a Paladin student. 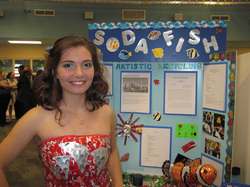 Students won the essay contest and earned trips and membership in local environmental venues. Usually the ER Ambassadors go off-campus to share their knowledge about environmental stewardship. But in February, children from Broward Estates Elementary came to the South Plantation campus for Immersion Day 2017. In modules developed by the ER Club, the youngsters rotated through different venues both inside and outside to learn about habitats plants, animals and water conservation. ER President, senior Casey Horland, coordinated the event. For the past several years, the magnet's Speaker Series invites an author who has a publication about a current environmental issue to speak to students. learned the importance of changing public policy about the fair and equitable use of our natural resources." In October 2016, Wenohan Hauter, Founder and Executive Director of Food and Water Watch, spoke to all magnet students. Her latest book, Frackopoly, covers hydraulic fracturing or fracking. ​ Sophomore John Paul Carriego won the preliminary essay contest about Fracking and opportunity to introduce Hauter. ​ After her presentation, the author answered specific questions, encouraged students to be activists about their beliefs, and signed books. "Students need to get involved in the decisions that affect their lives in the future through political action, " Hauter said. She also wrote Foodopoly, an account of the business behind the meat, vegetables, grains and milk that most Americans eat every day. ​ The speaker series is sponsored by Books & Books and F.E.R.M., the magnet parent organization. 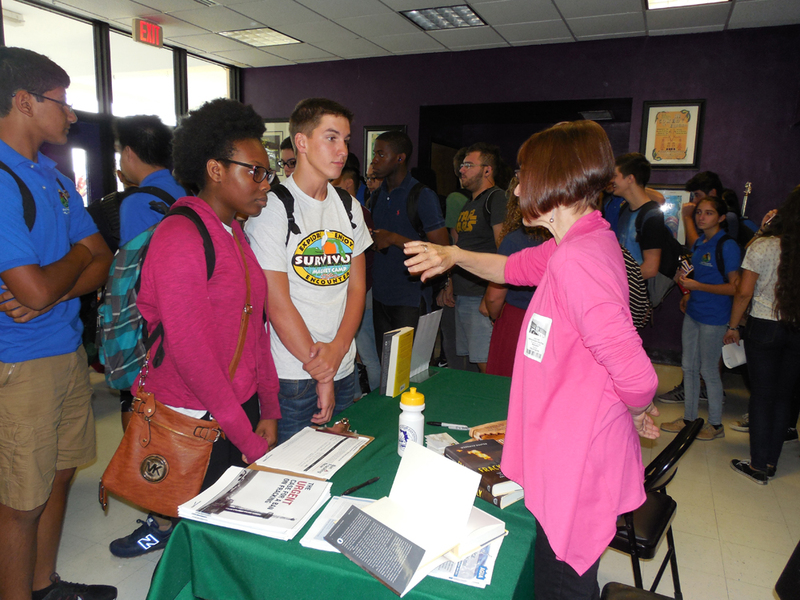 With a new approach to accommodate the dates of senior activities and exams, the magnet program held it annual Senior Symposium in early March instead of late April. 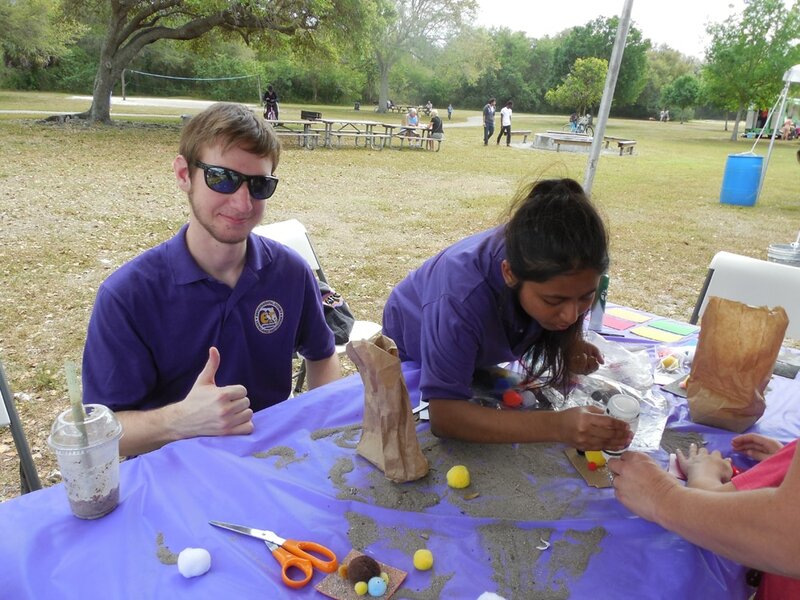 Humanities, Marine Science, Zoology, Ecology and Internship classes were options for the soon-to-be graduates to create their projects culminating their four years in the Environmental Science and Everglades Restoration program. Because the magnet encompasses all areas of school including the arts and sciences, the projects varied from recycling to music, from technology to writing books. In order to graduate as a magnet student with successful completion of the four-year curriculum, seniors ware required to have a suitable project. They will receive the Gold Medallion to wear at graduation at the Magnet awards Ceremony in early May. 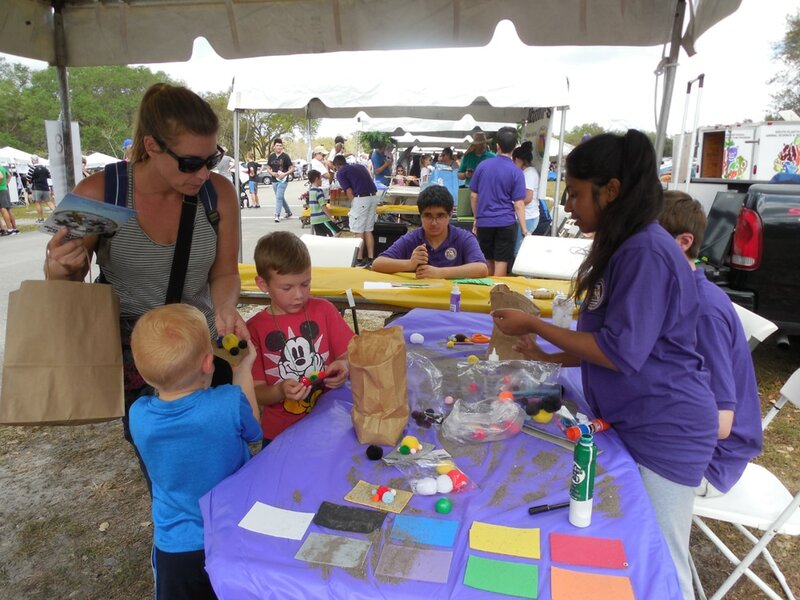 The Environmental Science and Everglades Restoration program hosted an open house, a Magnetic Experience, January 14, 2016. If you missed the Open House, call for information at 754-323-1982. Prospective students and their parents toured the school, met the staff, and found out information specific to the science-based magnet. The magnet is open to all students throughout Broward County. Qualified students are accepted into the nationally recognized program through a random-selection process. In addition to completing the application online, parents must submit their child's most recent test scores and report cards. Broward County Public Schools has a specific application process. 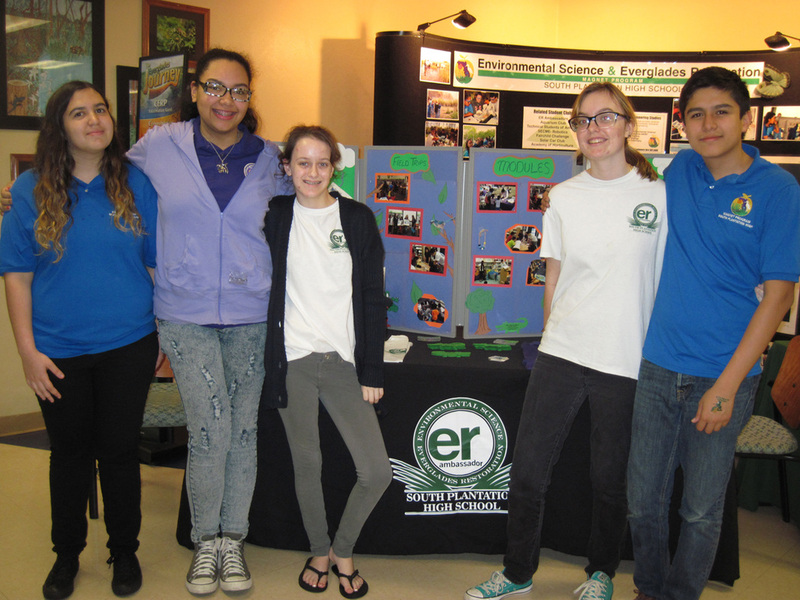 Magnet students continue to explore environmental issues as they participate in the Fairchild Challenge in Coral Gables under the guidance of Ecology, Pine Jog (dual enrollment) and AP teacher Jessica Brown. For the past 10 years, South Plantation students have successfully competed in the options created by the Fairchild Tropical Botanical Gardens personnel. Former Magnet Coordinator Pam Krauss began competing and with different teams won seven consecutive titles, a feat still unmatched in 2016. Options vary from art, debate, essay writing and community service enabling students of varying talents to explore different environmental issues. 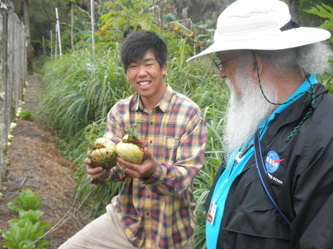 Fairchild offers different workships at the gardens in Miami to assist the students throughout the competition. 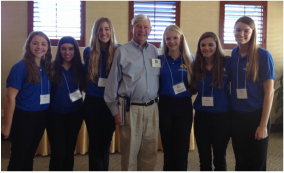 At the January 2014 Everglades Coalition held in Naples, Florida, Senator Bob Graham spent time with the South Plantation contingent. While a U.S.Senator he helped develop the restoration policy for the Everglades. 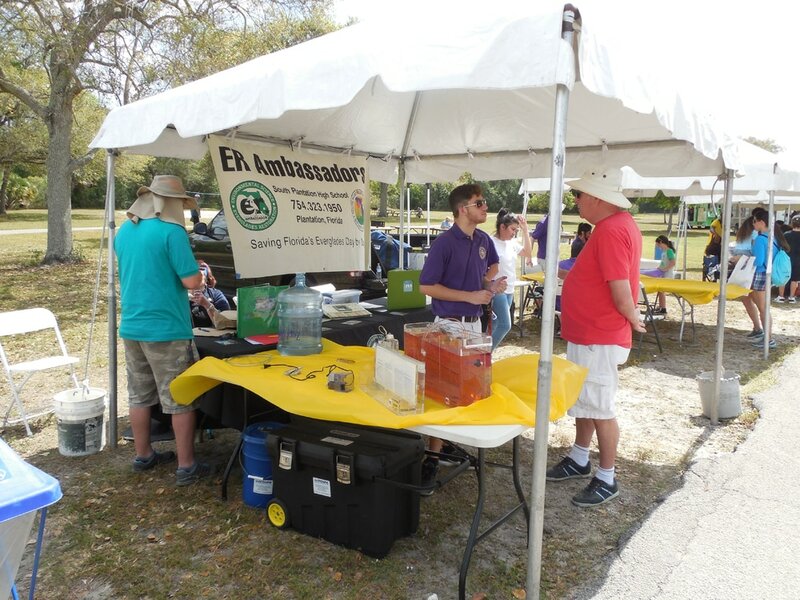 The Coalition is an annual gathering of the stakeholders involved in the restoration of the Everglades. South Plantation magnet students and teachers have participated in the event for the past 13 years, the only group of students to be involved all those years. 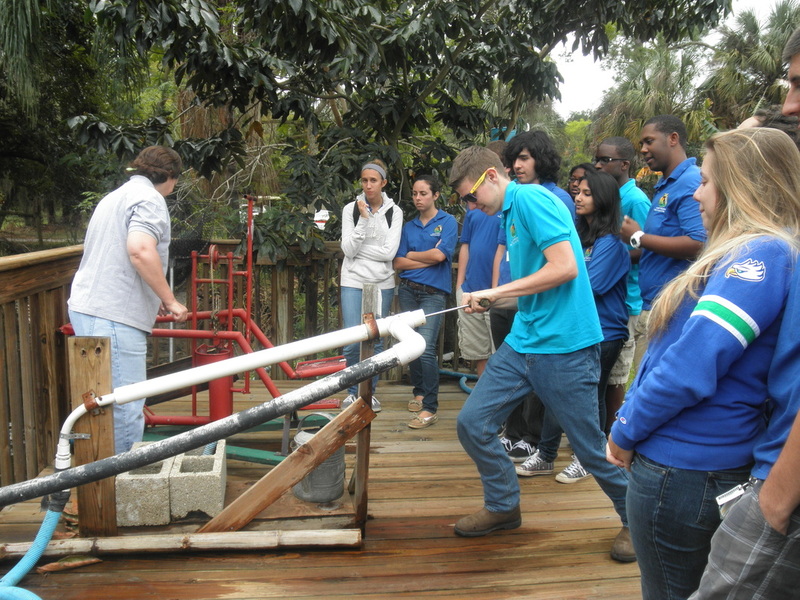 At the 2013 Magnetic Experience prospective students explore the Environmental Science and Everglades Restoration magnet program. 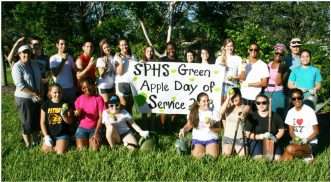 A government shutdown did not keep students in the Environmental Science and Everglades Restoration magnet program at South Plantation High from celebrating National Public Lands Day known as the Green Apple Day of Service on October 4, 2013. More than two dozen students and community volunteers worked during the morning to refurbish and maintain the hardwood hammock that former magnet students created at Jack Carter Harmony Park in Plantation. The seedlings other students planted six years ago have grown into mature trees and shrubs proving a refuge for local wildlife and cool shade for residents who walk in the park. Later the volunteers worked in the wildflower garden that skirts the parent drop-off road at the school and includes powderpuff, tickweed, blanket flower and Florida's state wildflower. that bloom but the students must remove weeds and add mulch to help control the weeds. Students will continue to work both gardens during the year under the guidance of Magnet Coordinator Pamela Krauss and student coordinator Katie Van Winkle. Before they left, the students prepared the school vegetable gardens for a winter planting. Last year the vegetables were donated to a local food bank. ECHO (Educational Concerns for Hunger Organization) Farm is a non-profit organization determined to fight world hunger by seeking alternative, sustainable methods of farming in difficult climates. Magnet seniors had the opportunity to explore ECHO farm and their farming techniques. Studying wildlife and their habitats is part of the Environmental Science and Everglades Restoration Magnet at South Plantation High. 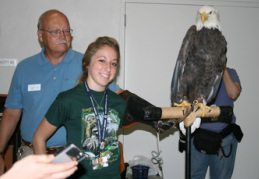 On May 17, 2010 more than 300 magnet students will be able to see a program featuring a bald eagle and learn from Lynda White of the Audubon Society. Two programs are scheduled: 8:30 a.m. and 9:30 a.m. in the Culpepper Amphitheater at South Plantation High located at 1300 S.W. 54th Avenue in Plantation. 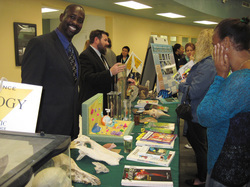 The event was co-sponsored by the South Florida Audubon Society (Broward County).